I was at the range yesterday and found one rifle case with the head stamp Sears 30-30 Win on it. It is also a straight walled case. Didn't know there was such a thing but then again I am interested in some history of this. Looked on line but nothing of value. Don't know anything about it and maybe some one with knowledge about it can elaborate on it. Probably why it was in the brass bucket it has a crack in the mouth about a quarter inch long. Thanks for any revelation to my inquiry. 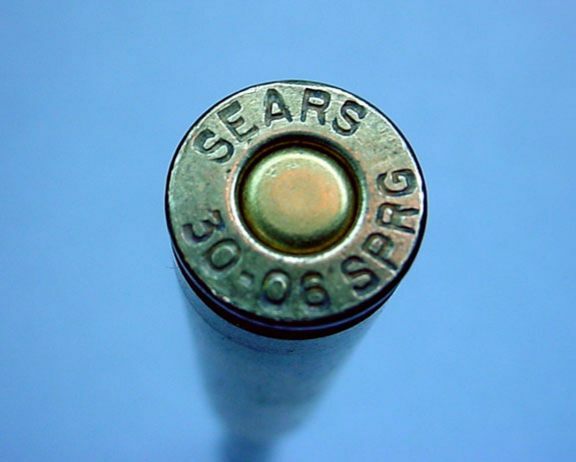 More than likely another round made from a standard 30-30 case. I've made 38-55 brass from 30-30 when in a pinch. It would look like what you describe. Could be someone has used 30-30 brass to make 38-55, 32-40 or maybe even .375 Winchester. I've made a fair amount of 32-40 brass from 30-30 over the years. 32-40 has always been hard to find and the 30-30 works good, despite being a bit short. It sounds like someone used a 30-30 case to make something else out of. My first thought was a 375 Winchester. Sounds like that is what has been done. I took my calipers and measured the inside of the mouth and it is .380 and it looks as though the shoulder has been resized. The case is the same length as a piece of 30-30 brass. I want to thank all of you for the input. I was at the range one day and there was a guy who was shooting an M1 Garand. He was firing away and I happened to notice that the ejected cases looked like a 45-70, (straight walled). It turned that out that he had loaded 308 Win ammo in his Garand clips! The RO stopped him and told him take he was done with his session. I make .32-40 out of .30-30. Thats real neat. I'd love to find something like that for my collection. Im a 30-30 fiend. It's a shame that all that cool old stuff, once every day common stuff, is now but a memory. While looking through some old once fired 30/30 brass I had I found one case that was nickle plated and the headstamp had "76" on it and then the caliber. I think it is Winchester brass, but I don't know for sure. No, I haven't taken a picture of it. I believe that is from the old Winchester Bi-centinnial commemorative ammo they sold, boxes go for pretty decent money now. I use .32 WS brass for my .30WCF Cast Bullet Loads. his empties and lucked out a got a few hundred new brass right here on forum on trades. Last edited by Tom W.; 10-24-2018 at 11:25 PM. A while back I bought a box of junk at an auction that had some 375 Win mixed in with some head stamped 30-30's. The 30-30's were fire formed to look like the 375. Don't know where I put them.